I'm on Virgin Cable BTW. what ur meant to do with tests like those is do it 5 or 6 times and average it out. I like this test best. You never seem to get constant results from those websites. This is my connection to the Virgin severs showing my full speed. If you know about news servers, then connect to your hosts news server and see what you get. The image below shows my speed and how long it'll take to download an 8gb file. Speedtests or websurfing in general is restricted to what the host can deal with. At busy times surfing can be slow for example. Also your own computer could be a factor. Another thing with these online speedtests is that you only download a small file, which when using superfast broadband speeds you don't always get a good reflection. Also, don't forget when measuring speed there's Kilobits and kilobytes, shortened to kb/s (or kbps) and KB/s. There's then megabits and megabytes. All sound similar but are quite different, so don't get confused when you do these tests. I often hear people say they are on 8megabytes broadband speed which would equal 65.54mbps. In reality they are on 8 megabits broadband which is 0.98MB/s. If you're still with me here, you can see the difference is huge. It's like confusing centimeters with meters. Use this tool to have a play converting kilobits to kilobytes to see what difference it makes to results and how reading them incorrectly could make you think you're on a faster or slower speed. All very boring of course, even sending me to sleep. But if you understand there's a difference then it'll help in future. If you already knew, don't flame me! Well i'd say take those results with a pinch of salt then. 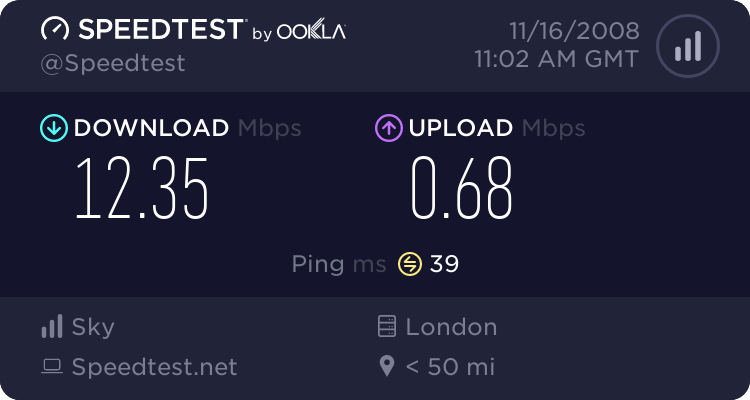 I never seem to get a good constant result with these sites and i'm on Virgin, the 20mb connection. Are you on the 10mb service? Yup, 10Mb.... I would upgrade, but can't see the point. BTW 50Mb is testing on Virgin. I wouldn't bother upgrading unless you download loads of large files. 10mb is fine for internet, gaming, and everything else. My 20mb connection only benefits me if i download a large file, like a game for example. Where it could take ages normally a game will only take me about an hour for an 8gb file. Was just about to read up on the 50mb service but just been to the website and it's down. Do you know if this is anew service or an upgrade for the 20mb customers? marshman wrote: Was just about to read up on the 50mb service but just been to the website and it's down. Do you know if this is a new service or an upgrade for the 20mb customers? It doesn't say yet. They don't give a price for 50Mb yet. Weâ€™ll be bringing it to our cable customers region-by-region â€“ and weâ€™ll be posting the dates for each region on our website closer to the time. Keep your eyes peeled to our website for more details. It wouldn't surprise me if they chucked it out at a higher price tbh. I'm hoping they just move everyone up a scale and i end up on 20Mb without having to pay more. I might need a new surfboard cable modem tough. Well make sure you don't end up paying for it if you have to. I never buy anything from them and i've been with them since Telewest days. Had new modems and wireless routers free, just tell them you aint paying. I've had a dodgy broadband connection (Sky) for a while now - it's slow and intermittent. 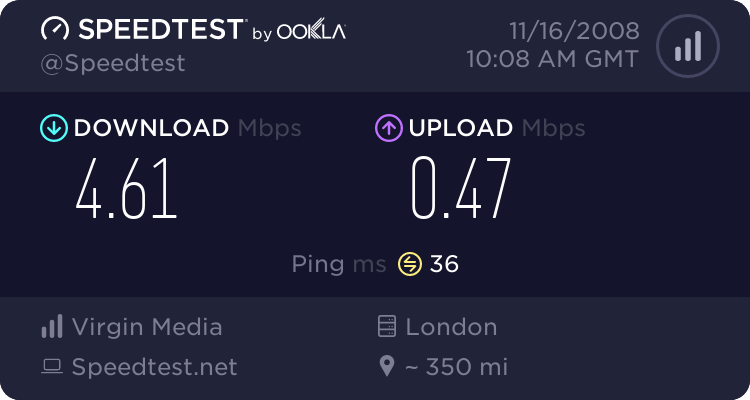 It looks as though it's an issue with the actual line because when they've done tests, they're expecting around 6MB and I'm getting less than 2MB. Unfortunately the lines are maintained by Openreach and Sky can't do anything until Openreach get off their backsides and sort it out. I'm not holding my breath, although I did tell Sky if it wasn't sorted soon I'd be going back the dreaded Virgin. "Mr Underwood, You are truly a master of the mysteries that are not revealed to us mere mortals." I was lucky to get here, as im having a lot of trouble with my connection speed. Thats why im asking for your help. I've been having issues for some days now, and every speed test i do, offers different results. I am really lost here. cheers and thanks in advance. I dont know the reason why my speed seems to be slow many of them said that if Cable Internet services share bandwidth with satellite Internet access. If there are many subscribers using that same bandwidth, it can slow down the connection. kindly guide me how to solve this problem .